If you will encounter same problem, make sure your weblogic.xml file is valid. Download working sample application - ADFSecurityValidUsers.zip. Getting same error when using form based authentication. And when I login, , I get 403 forbidden error.Can you plz provide help to solve this. Might be last comment was not clear, But I am facing this error from long time. When I change my authentication method from HTTP BAISC to FORM based authentication(and provide default login and error pages), I get the same error 403 forbidden. I get the same error but my case is a lot different. I created a simple(No Security enabled) jspx page in JDeveloper 11g and it works really perfect on pc browsers.I get that error whenever I want to load that page on my mobile emulator browser!!! It doesn't work even on real mobile browsers like iphone Safari. this happens when i try to refresh the page using F5.... any idea why? I did download your sample code, deployed on weblogic, but still encountered the same error. I need to access to the page, directly, using context root url. Probably you are using wrong context root. Firstly, I deployed an EAR file instead of WAR. 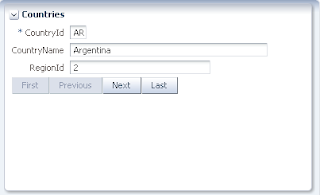 (deploying ear file was not accessible by right clicking on the project, in jedeveloper : application menu > deploy) and the login page appeared correctly. Then I noticed the other page that an unauthenticated user has not privilege to access, is accessible before logging in. I compared my web.xml with oracle workspace's web.xml. and this problem was solved too by making these changes. it seems that it doesn't need to add added security roles to weblogic.xml. I have a server with Oracle Linux 6.3. 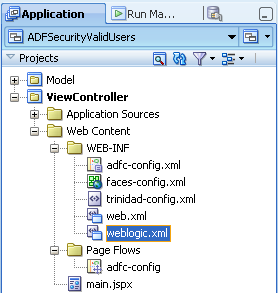 This ADF successfully deployed and started when I using integrated WebLogic server in JDeveloper. [11:04:06 AM] Target platform is (Weblogic 10.3). [11:04:29 AM] Application Deployed Successfully. I haven't any security configuration..
You are an expert in ADF and could you please help me? It would be great!